My response to a pro-voucher newspaper editorial. Yesterday the Times of Trenton printed an editorial arguing for expanded “universal school choice transfers”, a euphemism for vouchers. In the opinion piece’ Israel Teitelbaum, secretary of Alliance for Free Choice in Education, argues that the government should return the money that it collects in school taxes to parents so that they can make a choice about where to send their children to school. Sounds good doesn’t it? What could be more American than choice? In truth, the first thing that is more American than school choice, is a free, quality public education. American leaders of the past recognized that free access to an education was necessary to maintain a democratic society; to teach young people to live and work together with others and to teach the skills necessary for full participation in a free society. Paying public school taxes, whether or not your children go to a public school or even if you have no children, is a civic responsibility. Some things are not open to choice, even in a free society. We pay taxes for police and fire protection. We pay federal taxes for military protection from foreign enemies. We pay taxes for public parks and recreation areas. We are not individual actors in civic duties. We join together for the common good. Teitelbaum argues that school vouchers are the “clearest pathway to restore our country to our former greatness.” He is wrong. Vouchers have been in place for poor families in Milwaukee, Wisconsin for more than 20 years. While Teitelbaum sights the opinion of Milwaukee’s mayor that these programs have been successful, he fails to cite actual studies of the program that show that voucher schools do not on average outperform public schools. Teitelbaum also cites the District of Columbia Opportunity Scholarship voucher program, but fails to cite the congressionally mandated study that found “no conclusive evidence that the [vouchers] improved student achievement” (Ravitch, Reign of Error, 2013). What a universal voucher program will do is destroy public education. Vouchers rob money from the already cash strapped public schools and give it to schools with agendas that are distant from the common good. Yesterday, Politico reported that this year taxpayers will send one billion dollars of their tax money to schools that teach creationism and denigrate 200 years of established science. Is this the kind of choice we want for our public monies? Many voucher schools operate outside of the educational and financial oversight that is built into public education. Many employ unqualified teachers. Fiscal mismanagement is rampant. Voucher proponents have argued that school choice will allow low income and minority children to go to a school with their more affluent white peers. Not true. In their new book, 50 Myths and Lies That Threaten America’s Public Schools, researchers David Berliner and Gene Glass, point out that school choice has actually increased school segregation, leaving disadvantaged students, more and more, in segregated under-funded public schools. Yes, urban public schools have severe problems, but the majority of those problems can be attributed to the effects of poverty. Schools matter, but study after study has shown that poverty matters more. Until our country, and our voucher proponents, are willing to address the issues related to 23 % of our children living in poverty, our promise of a quality education for all will remain an empty promise. Instead of the market forces voucher scheme promoted by Teitelbaum and many others outside of the education world, what we really need to provide first is relief from the debilitating effects of poverty that yield many children unable to take full advantage of educational opportunity. Then we need to provide all children with an adequately staffed, well-resourced, neighborhood public school. And, yes, we need to use our tax monies to do it. Voucher programs offer a false choice for a democratic society. The corporate education reformers love to tell teachers what they need to do, what they have failed to do and where they need to place their focus. One of their favorite pieces of advice to teachers is that since teachers can’t fix the problems outside of school (such as poverty), they should focus on what they can do in school, which is improve instruction and learning. I am all for the continuous improvement of teaching and learning, in fact, I have dedicated my life to it, first as a classroom teacher and later as a teacher leader. I believe that most of us who are in education are dedicated to continuous improvement of practice; that is the very definition of professionalism. To believe, as we are told by the corporate education reformers, that education is the only or best way to end poverty in this country, is to believe in magical thinking. Poverty is not the fault of lax education and poor educators and it cannot be fixed by focusing on the classroom. But, since the reformers like to tell educators what they can and cannot do, I would like to return the favor. Here is a list of things that various reformer groups can’t do, along with some suggestions for what they can do. What they can’t do: Improve the quality of public education through market forces. These plutocrats love to spend their tax deductible dollars in an attempt to reshape public education in their own narrow corporate competition model. The model will not work. Study after study has shown that effective school improvement comes through a strong collaborative process that involves teachers and school leaders working together on continuous improvement (Anrig, 2013). The corporate competitive model, which includes charter schools, vouchers and teacher accountability based on test scores kills collaboration and turns public education into a reality TV version of The Hunger Games. The “market forces” paradigm will enrich a few corporations and a few individuals and destroy public education, without improving teaching and learning. What they can do: Spend their money elsewhere for the public good. 1. Support wrap around programs that provide for prenatal health care for all children, universal high quality pre-school and health clinics in schools in high poverty areas. 3. Pay a fair share of taxes, instead of hiding behind tax dodges, and support the spending of those tax dollars on making sure poor people have more money. This country significantly reduced senior citizen poverty through Social Security. Similar programs would reduce poverty much more significantly than a focus on schools could. Making sure people have more money is the only way to attack poverty (Bruenig, 2013). What they can’t do: Test and punish schools into improvement. No Child Left Behind established that test and punish was a bankrupt educational reform plan. By bribing states to double down on that false idea, through Race to the Top, Duncan and Obama have insured a narrow curriculum focused on what is being tested and a toxic school climate where teachers and supervisors view each other as enemies rather than partners. Since the 1980’s the National Assessment of Educational Progress (NAEP) has shown to be a rigorous and reasonably valid and reliable assessment of how our nation’s school children are performing. This is the only assessment with which the federal government need concern itself. Once out of the test and punish business, the US DOE and Mr. Duncan can focus on building partnerships for innovation with public schools aimed at collaboration and professional development aligned to sound educational practice. As long as charters use methods to exclude struggling learners from their rolls, maintain unusually high attrition and suspension rates, use draconian discipline policies and fight audits of their finances, they cannot claim to be public schools and they should not receive public funds. This would mean reverting to the model of charter schools envisioned by Albert Shankar, where public school educators joined together to try out innovation with hard to teach children in charter schools and then shared the ideas that work with teachers in other schools. What they can’t do: Improve education by attempting to destroy teachers unions, raiding pensions and denying teachers due process rights. What they can do: Insure that urban areas get their fair share of tax dollars so that they can provide a quality education in an adequately staffed, fiscally stable, safe, clean learning environment. What they can do: Remake themselves as Teacher Aides for America (TAFA) and work as valuable teacher aides in the classroom, while taking coursework toward teacher certification (if they do want to make a career of teaching). What she can do: Go away. Please. How did you learn to write? Can you point to particular lessons? Particular teachers? Particular assignments? When did you know you were a good writer? When did your writing achieve voice? When did you develop a discernible style? Now that you are thinking about how you learned to write, begin thinking about how you would teach someone else to write. What lessons would you provide? What would you have students read? What assignments would you design? How would you teach voice? How would you teach style? If you stop to think about all things that children need to know to write well, you would likely throw up your hands at the prospects of success. Spelling. Punctuation. Capitalization. Handwriting. Grammar. Sentence structure. Paragraph structure. Organization. Cohesion. Sequence. Narrative structure. Argument. Parallel Structure. Style. Purpose. Figurative language. Subject-Verb agreement. Tense. Point-of-view. Coordination and subordination. Voice. The list goes on and on. And then on top of all the skills, we must concern ourselves with the will to write. Where does the motivation come from? I think it is a mistake to think in terms of teaching when it comes to writing. Writing well can’t be taught, but it can be learned. We learn to write by reading in a special way. Children learn to write through an apprenticeship to writers. The job of the teacher becomes to help children see themselves as members of the “writer’s club” and to create an environment where students use that membership to develop skill as a writer. More than thirty-years ago, Frank Smith posited that children learn the complex task of speaking by “listening like a speaker.” That is to say that because children had the motivation, indeed the need, to speak, and because they were made a part of the world of speakers (a member of the speakers club) they learned to speak. Similarly, if we can make children feel like members of the writing club, Smith said, they will learn to write by “reading like a writer" (Smith, 1983). Yesterday, I had the opportunity to observe a pre-kindergarten class full of children aged 4 and 5 in a writing workshop. After a brief lesson on shoes and the concept of “pairs”, during which the teacher, Mrs. F, skillfully enlisted the help of the class puppets, Curiosity and Bubba, the children were invited to go off and get their journals and write about their favorite shoes or whatever else was on their mind. As would be expected in a class of children this age, some children “wrote” by scribbling, others wrote by drawing, while a few combined drawing with some words they knew how to write. One child, Jamya, combined a drawing of her favorite shoes with a string of letters and letter-like shapes. She read her story to me and while the “words” were not recognizable to me, she was able to point to each shape and tell me the story it represented. Next, she did an extraordinary thing. This 4 year-old picked up her journal, walked over to the cat puppet, Curiosity, and read her story aloud. Jamya is an author who has found her audience. Jamya is well on her way to being a writer. She can write only a few words and letters, but her writing has voice and passion. Most importantly, she considers herself a writer with something valuable to say and she seeks out an audience for her writing in the form of the classroom’s beloved puppet. Jamya has a great writing teacher. Mrs. F has set up a writing environment where young authors can hone their trade. How can all teachers achieve a classroom environment where children consider themselves authors and where students apprentice themselves to other writers to strengthen their writing? I think the first step is to help students feel like they are members of the writing club, so that they "read like a writer" and apprentice themselves to skilled writers. Students are most likely to feel like real writers if they are given plenty of time to write, lots of choice in what they write about and real audiences to write for. The Writer's Workshop as conceived and popularized by Lucy Calkins and others out of Teachers College Columbia, provides the ideal structure for creating writers. In this structure, the teacher provides instruction in the form of a brief mini-lesson, followed by lots of time for children to write and confer and an opportunity to share their writing at the end of the session. It is easy to imagine mini-lessons that focus on the mundane "stuff" of writing: spelling, punctuation, capitalization, grammar, etc. It is more difficult to craft lessons that focus on the qualities of good writing, but it is also more important. Good writing is less about knowing how to punctuate dialogue than it is about knowing how to use dialogue to advance a narrative, reveal a character or foreshadow plot complications. Teachers need to provide samples from their own writing and from the writing of others to show students how skilled authors craft their writing for maximum impact. In this way, the teacher fosters the ability of young writers to "read like a writer." As more and more examples are provided, students begin to find examples of what authors are doing in books that they read and begin to incorporate these things into their own writing. Along the way, the teacher should help students find "mentor texts." Ralph Fletcher defines mentor texts as texts "that you can learn from." In other words, we want to help children find books that will guide them in developing their craft. When students find a book or author that they love, they can apprentice themselves to that author and find crafting ideas to include in their own writing. Students then must be given lots of time to write and lots of leeway in what they write about. Just as aspiring adult writers are advised to "write about what you know", so young writers will write best when they can choose to write about those things they know well. What they know about is being a kid and everything that comes from that. They also may know about a topic that they have become obsessed with like dinosaurs or airplanes or horses or baseball. These are the topics around which they can learn their writing craft. The apprentice writer also needs lots of in-process feedback. Feedback must be regular and timely. Feedback must also focus on the crafting of the message and not on the more mundane aspects of spelling and punctuation. Teachers can help students become apprentice writers by first focusing on assisting the student in crafting the message artfully and later helping to clean up the mechanics. Finally, all writers, young, old, skilled and still learning need an audience. In writer's workshop the teacher and other students often serve as the audience during Author's Chair sharing time. Great writing teachers, however, need to think of broad and authentic audiences for their aspiring writers. One way is through letter writing. Students may be encouraged to write letters through an in-school post office where they can write to students and teachers in other classrooms. Letters can also be written to the school newspaper, the local newspaper, to local politicians or to school administrators. Classroom or school-wide literary publications are another way to help children see that their writing is intended for others to read, enjoy and learn from. Magazines like Stone Soup and Merlyn's Pen provide an outlet for student writing, as do local essay contests. It is critical; however it is accomplished, that apprentice authors envision a genuine audience for what they write. How does all this fit in with the Common Core State Standards in English/Language Arts. The standards lay out targets for what children should know and be able to do in writing. As such, although I could and have quibbled with aspects of the Common Core, they are not horrible. The real danger of the Common Core comes from being closely linked to standardized testing. Standardized tests tend to reward formulaic writing (if they assess writing at all). If the Common Core narrows the curriculum, so that children are taught to write to a standardized test prescription, then the Common Core will have done a great disservice. Those who have crafted the Common Core say that they do not wish to tell teachers how to teach. I say we should take them at their word and teach the way we know will work best for creating writers. The teaching of writing is alchemical. It involves teachers assisting children to envision themselves as writers for real audiences, helping them discover mentors to guide their development, providing timely instruction and feedback, and then standing alongside as they spin their straw into gold. As a teenager one of my favorite books was The Devil's Dictionary by Ambrose Bierce. His satirical definitions of words struck at the heart of hypocrisy in the early 20th century. For example Bierce defined absurdity as a "statement or belief manifestly inconsistent with one's own opinion." The humor struck a chord in my snarky teenage brain. Now as a snarky senior citizen, I borrow from Bierce to present The Devil's Dictionary of Education Reform. A month ago I set out to write 30 twitter size sound bites capturing the hypocrisy of the corporate education reform movement. Here is a compilation. If you have some defintions to add to the collection please send them along to me. 21st Century Skills - a broad range of abilities, enumerated in the Common Core , that 21st century children need to thrive in the 20th century. accountability - holding the 99%, especially teachers, students and administrators, responsible for the damage done by the 1%. achievement gap - symptom of income inequality and segregation treated by education reformers by testing children and punishing teachers and public schools. blended learning - a unique blend of educational experiences that combines inferior online learning with inadequate classroom instruction. Broad Superintendent's Academy - a place where people who are totally ignorant about education go to have their ignorance reinforced. choice - allows parents to choose a school by "voting with their feet" as long as their children's feet are not attached to a child with special needs. Common Core - what a group of private school graduates think public school kids need to learn to be ready for a college they can't afford. competition -applying market forces to education to insure that private companies can feed at the public trough. cut score -manipulating the proficiency level of standardized tests in order to punish children, teachers and schools. cyber charter - an innovative school design that turns public funds into private profits and low student achievement. education philanthropy - tax dodge for the very wealthy that allows them to advance a personal agenda over the dead body of public education. education reformer - a curious breed of American entrepreneur who tired of abusing employees and moved on to abusing teachers and children. grit - the kind of dogged determination required to sit through a David Coleman explanation of close reading. market forces - applying the same principles that destroyed the American economy to schools in an attempt to destroy public education and turn a profit. MET Study - rigorous, wide ranging study of teacher effectiveness designed, funded and promoted by Bill Gates that proves that Bill Gates can buy what he wants. No Child Left Behind - the soft bigotry of stupid federal education policy (see also Race to the Top). no excuses - a type of child abuse reserved for inner city minority children attending charter schools (see also on the bench). on the bench - solitary confinement for inner city minority children in no excuses charter schools. parent trigger - a law designed by education reform carpetbaggers to dupe well-meaning public school parents into shooting themselves in the foot. poverty - the elephant in every urban classroom that education reformers want teachers to ignore. Race to the Top - federal bribery scheme designed to get state departments of education to race across the Bridge to Nowhere and into the the clutches of standardized test companies. rigor - a Common Core instructional practice designed to make students think deeply and critically about everything except the Common Core. school choice - right of parents to make a choice of the school for their children, unless their choice is an adequately staffed, well-financed neighborhood public school. seniority - a roadblock for education reformers on their way to providing an inferior education on the cheap. standardized test (1) - ever growing practice of interrupting student learning in order to collect unreliable data for bubble-headed policy makers. standardized test (2) - multiple choice test given to public school children to determine how much money their parents make. Teach for America - way station for the young and privileged on the road from the Ivy League to Wall Street. tenure - due process for teachers that stands in the way of replacing highly qualified professionals with cheap labor. turnaround - what reformers want parents teachers and children to do while they shut down their neighborhood schools. value added measures - sophisticated statistical measures that prove with 100% confidence that statistics can't be used to measure teacher quality. vouchers - a bit of modern day alchemy that turns public education tax dollars into private corporation gold. Several months ago I wrote a piece entitled, Round Robin Reading Must Die, calling on all teachers and teacher leaders to work to wipe out this ineffective and yet widespread instructional practice. I listed ten well-researched reasons why round robin was bad practice. Clearly, it is going to take more than one lonely blog screed to kill round robin. Recently, I visited a school where virtually every teacher was using round robin reading's evil step-sister, Popcorn Reading. Indeed, Popcorn Reading is popping up all over. Google "Popcorn Reading" and you get a roughly 50/50 mix of sites recommending the practice and sites ridiculing the practice. 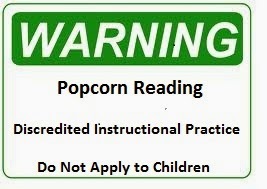 There is no serious research in the literacy field that supports Popcorn Reading. The definitive book on the topic was written more than 15 years ago, Good-bye Round Robin, by Michael Opitz and Tim Rasinski, and yet the practice persists. How can we keep Popcorn Reading from popping up all over the place? Maybe by focusing our message. Rather than my wordy, research citing approach from the previous post, perhaps what we need is a Popcorn Reading warning label. Popcorn Reading has a negative impact on fluency development. Popcorn Reading has a negative impact on decoding. Popcorn Reading has a negative impact on reading comprehension. I could go on, but then we would lose our short pithy message. Join my struggle. Restrict popcorn to the movies. Recent research out of Stanford University by Adriana Weisleder and Anne Fernald reinforces much of what we already know about the importance of talking to young children as a way to help them develop the oral skills and vocabulary necessary to excel in school. Wesleder and Fernald not only provide new insights into our understanding of early language development, but they bring a new term to the table that I just love – linguistic nutrition. Just as a toddler’s future health and well-being is dependent upon food-based nutrition, so too, is child’s future success in school dependent on linguistic nutrition. Like many of you I am sure, I try to give money to organizations like Philabundance, in my home town, who do heroic work in providing food to families in need to help insure that we can narrow the health gap for children. What Weileder and Fernald’s term suggests is that if we are going to narrow the learning achievement gap we need to spend resources on linguistic nutrition as well. In this study entitled, Talking to Children Matters: Early Language Experience Strengthens Processing and Builds Vocabulary, the authors say, “"Parents need to know the importance of providing linguistic nutrition and exercise to their young children. By talking with them more in an engaging and supportive way, parents can nurture early brain development and build a strong foundation for language learning." The authors further found that toddlers do not develop this ability simply by listening to adults talking around them or watching a television show, the talk must be in the “context of meaningful interactions with those around them." Weisleder and Fernald studied a relatively homogeneous group of low-SES, Latino families. A central finding of the research was that SES does not determine the quality of the child’s language experience. They found that “[d]espite the challenges associated with living in poverty, some of these moms were really engaged with their children, and their kids were more advanced in processing efficiency and vocabulary." The researchers are following up their study by working on interventions with disadvantaged Latino families in order to help parents learn to engage effectively, linguistically with their children. The goal is to educate families about the central role family talk can play in fostering a child’s language and vocabulary development. It strikes me that this research and the follow-up these authors are doing is central to narrowing the achievement gap. It suggests exactly the kind of wrap around services recommended by Diane Ravitch in Reign of Error. The standards, charter schools, vouchers and test and punish programs foisted on public education by the corporate education reform movement are doomed to failure when it comes to substantive change in the achievement gap. Focusing on linguistic nutrition, on the other hand, shows real promise. Who will fund interventions such as the one started by these Stanford researchers? Mr. Gates? Mr. Broad? Mr. Walton? Ms. Rhee? How about putting your money and your propaganda machines behind something that can make a real difference? Weislader, A. and Fernald, A. (2013) Talking to Children Matters: Early Language Experience Strengthens Processing and Builds Vocabulary. Psychological Science. The only advantage I can imagine to being stuck on the tarmack for 2 hours at Austin-Bergstrom Airport last week while the plane was being de-iced was that I got time to read Greg Anrig's excellent book, Beyond the Education Wars: Evidence that Collaboration Builds Effective Schools, which has been sitting on my Kindle for a few months now. Anrig, is vice president, programs, at The Century Foundation, author of several books and a former journalist. Anrig's book begins with a brief history of management theory, focusing on two dominant theories put forward by Frederick Winslow Taylor and W. Edwards Deming. Taylor's thoeries eminated from the idea that workers could not be trusted and so he designed a management style based on punishment and reward. Taylor determined how much a worker should be producing and set workers goals accordingly and then tied their pay to productivity. Modern exemplars of the Taylor approach are bill collecting agencies, customer service call centers and national retail chains (Walmart?). Decades later, Deming, working in Japan after World War II, argued that long term business success required constant incremental progress, the kind that required workers and management to be deeply engaged in sharing information and ideas with each other. Modern day exemplars of the Deming model include Toyota, Sony, Southwest Airlines and Kaiser Permanente. Clearly, as Anrig points out, the national political debate over education reform has been driven by the Taylor model of management. There is a direct line from the Taylor model to such reformy ideas as merit pay, standardized testing and tying teacher evaluations to test scores. In other words, education reformers have embraced Taylor's carrot and sticks management style of education that failed the American auto and steel industries and that is currently used for only the most low levels of employment. Anrig shows that there is ample evidence that this carrot and stick method will not work in schools and plenty of evidence that a more collaborative approach, such as that endorsed by Deming, and used by many of the most successful corporations in the world, is a better way to go. Anrig cites solid research reports starting in 1990 that support the concept of a collaborative design for school improvement. These studies include those done by the Consortium for Chicago Social Research, The National Center for Educational Achievement and Century Foundation fellow Gordon MacInnes all of which come down to two key findings, strong leadership matters and a strong culture of collaboration between teachers and school leadership matters most of all. The studies found that change is slow and incremental, but it can be successful in any setting, including in high poverty areas, although change is even more challenging there. Education reformers do not trust teachers. Because they do not trust teachers, just as Taylor did not trust industrial workers long ago, reformers put forward management plans that seek to control workers, rather than engage professionals in systematic improvement. Education reformers wish to motivate change with the carrot of merit pay and the stick of the highly flawed Value Added Measures (VAMs) tying teacher evaluation to student scores on standardized tests. We know, and Anrig's book very persuasvley lays out, what works. Collaboration works. Teachers and principals working together to improve schools works. Having teachers compete for merit pay through flawed VAMs, not only will not work, but it will destroy the very collaboration that is so necessary for a highly functioning school culture. We want teachers working together to share instructional ideas, to puzzle out solutions to persistent problems, to design authentic assessments for students. The concept of the professional learning community, where teachers meet to share ideas and solve problems holds great promise for the continuous improvement of teaching and learning. The test and punish model of the corporate education reformers will inevitably kill collegiality and cooperation and, ultimately, public education. Concerted group action is the enemy of corporate education reform movement. That is why the reformers demonize teacher unions and support policies that will turn teacher against teacher. By driving a wedge through the profession, the education reformers hope to destroy public education and turn it to a for profit enterprise run like a widget factory. This is one way to distract the public from the real issue facing school improvement - poverty. And poverty is one thing the corporate education reformers do not want to touch. Really dealing with poverty would upset the status quo that is paying off so handsomely for the 1%. In these times, it is more important than ever for teachers to stick together, not only in the sense of unions, but also in the sense of building and maintaining the kind of collegial culture in the every school that reasearch has shown is the one true way to effect continuous improvement. Reading Anrig's book will help arm all in the profession against the false narrative of the corporate education reform movement. Anrig, Greg. (2013) Beyond the Education Wars: Evidence that Collaboration Builds Effective Schools. New York: The Century Foundation Press. Who is the most powerful man in public education? I don’t often disagree with anything Fair Test has to say, but in this case I know for certain of one person who needs the “new” SAT – David Coleman. With the rollout of the revised SAT, Coleman, now president of the College Board, completes the grand takeover of American public education from K-12 and beyond. Coleman is, of course, the chief architect of the Common Core State Standards (CCSS). Coleman has often reminded us not to worry; the CCSS are just standards not curriculum. As you read this; however, two testing companies, PARCC and Smarter Balanced, are developing high stakes standardized tests that are tied to the CCSS. It has long been established that when curriculum is tied closely to high-stakes tests, the curriculum is inevitably narrowed to reflect what is on the test. Coleman has also told us in the past that the CCSS do not tell teachers how to teach. But as Mike Petrilli, of the Common Core supporting Fordham Institute has said, “Of course we want to change the way teachers teach.” In fact Coleman has very publicly advocated for a teaching strategy called "close reading. The “new” SAT is also, as Coleman insouciantly posited yesterday, tied closely to the CCSS. And so, voila’, David Coleman becomes the most powerful person in American public education. It would seem important that we get to know the de facto leader of all public school students, administrators and teachers. Where has he come from and what makes him tick? Some clues come from a hagiographic piece in the New York Times Magazine published today. Coleman has bachelor’s degrees in philosophy from Yale and English literature from Oxford, and a master’s degree in ancient philosophy from Cambridge. He wanted to be a teacher, but lacking qualifications to work in public school, he took a job with the global management consulting group, McKinsey & Company. At McKinsey, Coleman became “increasingly obsessed with evidence-based solutions.” It is interesting to note that for all Coleman’s obsession with “evidence”, he has provided no evidence that CCSS will work, or for that matter, that the SAT is worth the time or money for students and parents. From McKinsey Coleman started the Grow Network, “which focused on assisting students and parents, including non-English-speaking families, in navigating an educational system that was increasingly dictated by standardized tests.” This experience led him to believe that the tests were based on standards that were too vague and needed to change. Coleman sold the Grow Network to McGraw-Hill and started Student Achievement Partners (SAP), which according to Wikipedia was “a nonprofit that assembled educators and researchers to design actions based on evidence to improve student outcomes.” Coleman and other consultants at SAP wrote the CCSS. Coleman also served as a founding board member and treasurer of Michelle Rhee’s Students First, the anti-teacher, anti-union, anti-tenure, anti-seniority, anti-collective bargaining, highly profitable, non-profit. Could the most powerful man in education today be anti-teacher? Eventually he left both Student Achievement Partners and Students First to take over as president of the College Board. Coleman has also graced us with evidence of how he would go about teaching a complex text; advice that teachers all over the country were clamoring for from this non-teaching architect of the CCSS. Still available on you tube here, is his “close reading” of Martin Luther King’s, “A Letter from a Birmingham Jail.” Coleman employs a technique called “close reading”, that was popularized by English professors and the author Robert Penn Warren in the 1930s and 40s. After watching the video, I am sure you will be convinced that this instructional strategy is a key for 21st century skills, no matter what we might have learned about engaging children in literature in the last 80 years. Just remember, it is not about how you think or how you feel. So there it is, a brief primer on the most powerful man in education. A man with no teaching experience, an obsession with evidence only when it suits his purpose, a former board member of Michelle Rhee’s Students First, and a man who “doesn’t give a s**t what you feel or think.” This is the man who completed his coup d’tat yesterday by tying the CCSS to the SAT. Is it any wonder that some of us are worried about the future of public education? Back in the sixties when I was in my folk music stage, a song by singer Ed McCurdy was making the rounds of the coffee houses. The song was called Last Night I Had the Strangest Dream and it was a powerful anti-war anthem later recorded by Simon and Gafunkel, Pete Seeger, Johnny Cash and many others. If you want to hear it you can find it here. For some reason, I could not get the song out of my head as I sat in a plane on the tarmack of Austin-Bergstrom Airport waiting to be de-iced (scary thought) for my flight home to Philly. The tune is very memorable and I thought it might be a good basis for a rallying cry for the anti-testing OPT OUT movement. Anyway, just for fun, here it is. The kind Bill Gates detests. To throw out standardized tests. And the room was filled with joy. Their lives changed for the better. Day 2 of the Network for Public Education Conference in Austin, TX began with people lining up in the aisles of the Lady Bird Johnson Auditorium to get Diane Ravitch to sign their copy of Reign of Error. Poor Anthony Cody struggled to get people into their seats to begin the first session. Teachers on a mission can be a non-compliant group. Finally the session, a panel discussion on the Common Core, began aboout 20 minutes late. It probably couldn't end soon enough for Randi Weingarten, the AFT President and Common Core supporter, who was given the lead position in the discussion and then had to sit uncomfortably as articulate and passionate opponents of the Core, Paul Horton, Geralyn McLaughlin, Mercedes Schneider and Jose Luis Vilson, took apart every positive point about the Core that Weingarten had presented. Weingarten said the Common Core standards were not the problem, over-testing was the problem. The key points made by Common Core opponents included how the Common Core was a top down process that did not include teachers in the development in a meaningful way, that the Common Core is developmentally inappropriate for early childhood education, that the Common Core prescribes instruction that takes away teacher professional judgement and that the Common Core was a part of the effort to undermine teacher unions. To her credit, Weingarten received the criticism with equanimity and professionalism, but she couldn't convince this crowd. Public education's Super Hero, Diane Ravitch, spoke next and offered red meat to the hungry wolves at the convention. Ravitch's theme was "Why We Will Win." She said that not one of the "reforms" advocated by the corporate privatizers was working. Not vouchers. Not merit pay. Not charter schools. Not value added teacher evaluation. Not improved student learning. She said that the reformers were losers. All of their ideas were failures. She called the charter school movement colonialism. She declared the US Department of Education an enemy to public education. At the end the crowd rose to applaud in appreciation of Diane's leadership and her indominable passion for public education done right. Jonathan Pelto led a lunchtime session for education bloggers. Jon and other bloggers are working to develop a loosly joined organization that provides support in the form of research, webinars, editorial advice and wikis that will help bloggers get their messages out and grow their reading audiences. More than 100 bloggers and future bloggers attended the session. Action planning sessions focused on the issue of organizing for further action. In the group I attended we discussed the need to recapture the narrative of public education that the corporate reform oligarchs have usurped. The difficulties of getting working teachers involved in the effort was another concern discussed. David Greene suggested that we all work in our individual states to join in the National Day of Action currently planned for New York and Milwaukee on May 17 - the 60th anniversary of Brown vs. The Board of Education. As the conference closed, Anthony Cody and Diane Ravitch announced that the Network for Public Education would be calling for a Congressional investigation into the overuse of standardized testing in the country. This blog will have more on the topic in the near future. For now you can read the press release here. All in all, a great conference. I put faces to the names of people I have been corresponding with over the past year, gained greater insight into the issues in the battle for public education and was energized to continue the battle. The lingering concern is that we members of the Network are spending too much of our time preaching to our own passionate choir and not enough time persuading potential allies to join us. Growing the movement will depend on getting the message to politicians, parents, teachers, students and taxpayers. I am feeling so fortunate to be here in Austin with so many passionate advocates for public education. There is literally a public education hero around every corner. Today I met superstar superintendent John Kuhn, author of Test and Punish, which I reviewed here. In one session I sat next to Karen Lewis, charasmatic president of the Chicago Teachers Union. In another session I got to meet and talk for a few moments with long time child and school advocate Deborah Meier. I had a morning conversation with blogger and teacher Anthony Cody who writes the Living in Dialogue blog for Education Week. I traded tweets with the wonderfully witty blogger Edushyster. I haven't been among a gathering of this many passionate progressives since I marched in the Moratorium Against Vietnam in 1969. The best quote of the day came from John Kuhn in his fiery keynote address: "Our kids education shouldn't be a sandbox for rich people." Kuhn's speech was full of such trenchant fare including, "The purpose of education isn't for children to become college and career ready, but life ready and capable of self-government." And "Anything that weakens public education weakens the nation." Other sessions focused on using social media to get the message out (I was placed in the remedial tweeting group), how best to frame the message so people will listen, and a session where several successful bloggers shared the various pathways to success. In this session, I was especially impressed with the thoughtful and heartfelt presentation of New Jersey's own Darci Cimarusti, who blogs under the nom de plume Mother Crusader. Self described as "just a mom", Darci put a lie to those words as she brought tears to the eyes of many with the heroic story of how she drove education privatizers out of her own town and how she is making life miserable for charter school wannabes throughout the state. A shout out also to Jonathan Pelto of the blog, Wait, What?, who uses his considerable experience in the political arena to hound public education enemies in Connecticut through campaign finance investigations and Freedom of Information Act requests. He was articulate and inspiring. In my own session I facilitated the presentations of bloggers Lee Barrios (geauxteacher), Bob Sikes (Scathing Purple Musings) and Katie Lapham (TeachersLetters2BllGates and Critical Classrooms). Each is doing heroic work in their own states beating back parent trigger laws and defending the rights of children. I concluded the session with my satire The House that Gates Built and with the story of my growing disenchantment with the Common Core. The session seemed to be well received.